A few weeks ago Hoop Somuah and I decided that since the Seahawks were going to the Super Bowl we needed proper attire, so we decided to show our 12th man pride by creating custom Light Hoodies. We ordered NeoPixel Strands, a Trinket Arduino board, a capacitor, and a battery pack from Adafruit, and set out to do some soldering, sewing and programming. NeoPixels are full LEDs and each pixel in the strand is individually programmable. The Trinket is not 100% Arduino compatible but it can be programmed using the Arduino SDKs, and at around $8 its a great little micro controller running at 8MHz with 8K of flash memory and 512 bytes of SRAM. The one caveat with using a Trinket to power the Neopixel strand is that each pixel takes 3 bytes of RAM to run. The Neopixel strips we cut for our hoodies had ~100 pixels so we used 60% of our memory budget just to support the pixels. When we added a button to control the light patterns we blew our memory budget and had to do some refactoring to reduce our memory footprint. For larger projects a larger board like the Flora would be necessary. 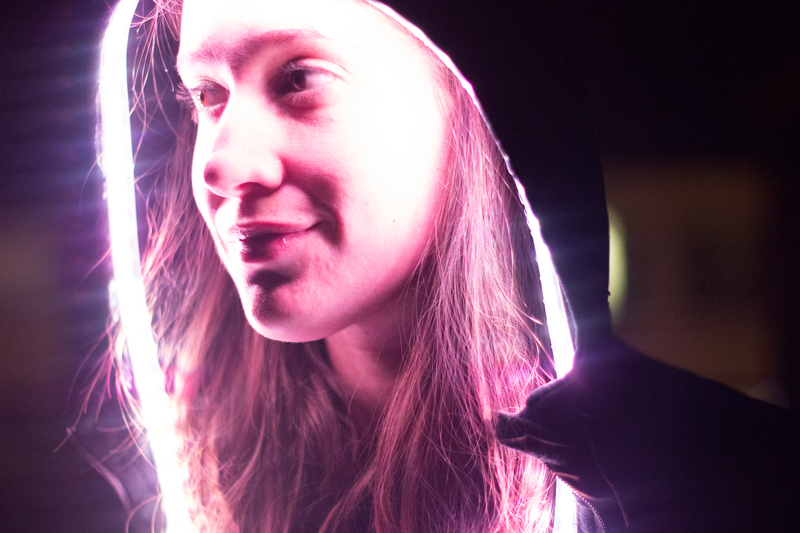 The code to power our hoodies is up on Github. So far we have written three programs. The original Hoodie contains the Seahawk code patterns. usaHoodie is USA themed for Sochi Olympics, and portraitHoodie is a set of solid lights I have been using in my photography class. This was a super fun project, and a great introduction to electronics for me. The Adafruit tutorials were great, and the products were easy to use. I’d highly recommend Adafruit for any DIY electronic projects. Currently Hoop and I are working on designs for Hoodie Mark 3. It may involve sound! Stay Tuned!